Howden le Wear is situated on the A689 between Bishop Auckland and Crook. The present church was erected in 1870 and refurbished in 1992. 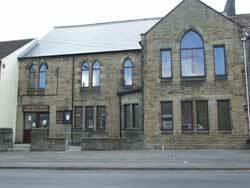 It is part of the main street, but is a ‘traditional’ chapel with gallery and pews. With the closure of the Anglican Church in 2008, the Methodist Church once again became the only place of worship in the village. All members of the community are welcomed, and links have been established with the local Primary school and with Weardale District Cubs and Scouts. and occasionally have a Family or Café Style Service with coffee afterwards. Monday & Friday Mornings: 10.00 – 11.30am : Carer & Toddlers Sessions. Open to all from the village, plus those from other villages/towns with no such group. Ages 0 – 3 or until old enough for Nursery / School. 3rd Monday in the month, September – May - Meal: 7.00pm. Open to all congregation, village adherents and friends. ‘Messy Church’ is usually held once during each school holiday. Children 0 – 10 are welcome, but must be accompanied by an adult, to enjoy craft work, food and worship. Please contact: Rev Christopher Humble.